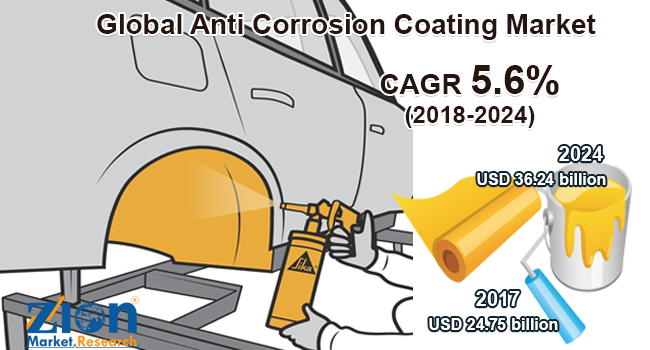 Global anti corrosion coating market expected to reach USD 36.24 billion in 2024, growing at a CAGR of 5.6% between 2018 and 2024. Anti corrosion coatings protect industrial equipment against degradation due to salt spray, moisture, exposure, or oxidation from industrial chemicals. The report covers a global and regional level estimation and analysis for the anti corrosion coating market. The study provides historical data from 2015 to 2017 along with a forecast from 2018 to 2024 based on revenue and volume. The study includes major driving forces and restraints for the anti corrosion coating market along with the impact they have on the demand over the forecast period. Furthermore, the study also provides the major avenues of global anti corrosion coating market. The global anti corrosion coating market study also comprises the detailed value chain analysis for providing a comprehensive view of the market. Moreover, the study also includes Porter’s Five Forces model for anti corrosion coating, to understand the competitive landscape of the global market. The study includes a market attractiveness analysis of all the segments related to the market. The study provides a significant view of the global anti corrosion coating market by classifying it into type, technology, end-user industry, and region segmentation. These segments have been estimated and forecasted with the future and past trends. On the basis of type, the anti corrosion coating market is classified into polyurethane, epoxy, acrylic, zinc, alkyd, chlorinated rubber, and others. The technology segment is divided into waterborne, solvent-borne, and powder coating. The end user industry in the report has been segmented into oil & gas, marine, industrial, power generation, infrastructure, automotive & transportation, and others. The regional segmentation includes the Middle East & Africa, Asia Pacific, Europe, Latin America, and North America. Furthermore, it is divided into major countries such as the U.S., the UK, Germany, France, China, Japan, India, and Brazil. Major vendors of global anti corrosion coating market include BASF SE, PPG Industries, Inc., AkzoNobel N.V., Axalta Coating Systems Ltd., Ashland Inc., Hempel A/S, The Sherwin-Williams Company, RPM International Inc. Jotun, and Kansai Paint Co., Ltd., among others.